Homemade Strawberry Freezer Jam doesn’t last long in our house. My daughter loves to spread it on croissants, my husband spoons it over ice cream and I love to spread it on my morning toast. It’s so delicious!! Store-bought jam just can’t compare. 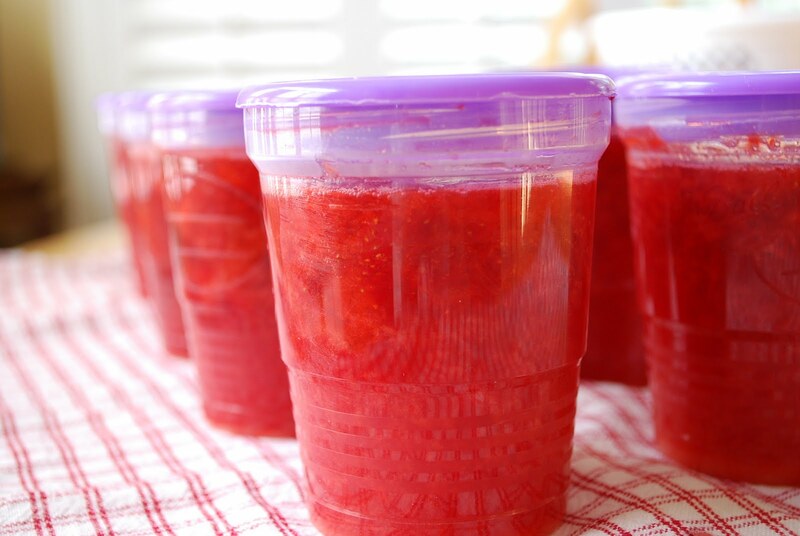 This strawberry freezer jam recipe is simple, quick and will keep for months in the freezer. After opening, store in the refrigerator for up to three weeks. Be sure to follow the directions, exactly as written, in your pectin box. The timing and quantities are VERY important to ensure a good consistency. Using whey low sugar in this recipe cuts the calories to only 13 calories per tablespoon!! It also tastes exactly like sugar, so you won’t know the difference. Wash, scald and dry containers and lids. You can do this in your dishwasher or I put mine in a pot of boiling water for several minutes. 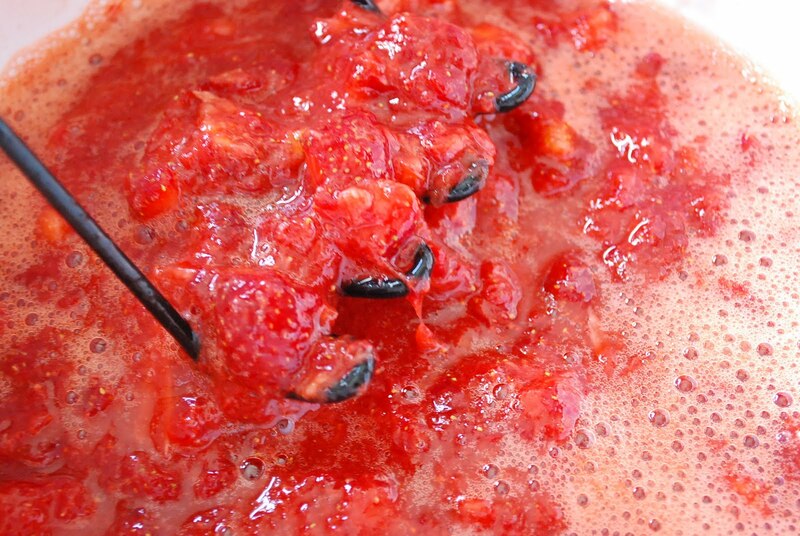 Wash berries and remove stems. Place in a large bowl. Mash berries with a potato masher or pulse a few times in a food processor. I use the hand mash method because I like my jam to be a bit chunky. Pour mashed berries into a measuring cup and make sure that you have exactly two cups. Measure whey low or organic sugar accurately by scraping a knife across a full cup to level. Place into a separate bowl. Combine sugar and berries in a large bowl and stir until thoroughly mixed. Let stand for 10 minutes (very important), stirring occasionally. 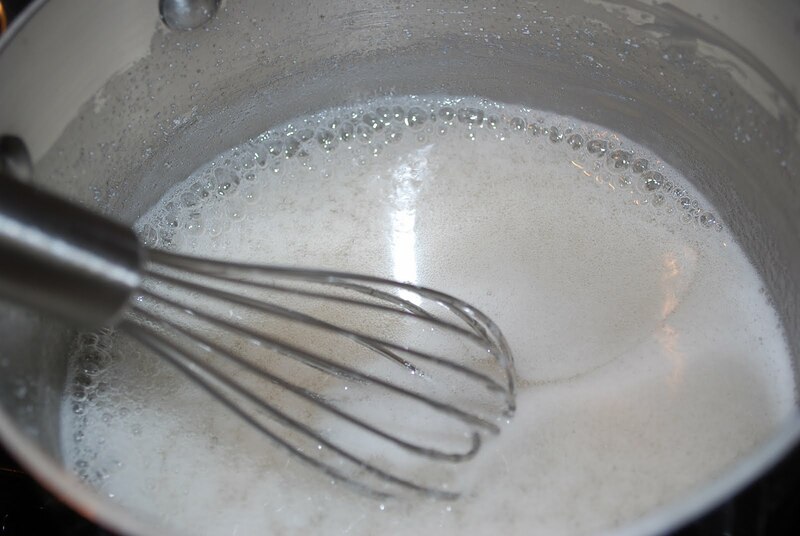 Mix 3/4 cup water and one box Can-Jel into small saucepan. Over high heat, bring to a boil and boil for exactly one minute, stirring constantly. 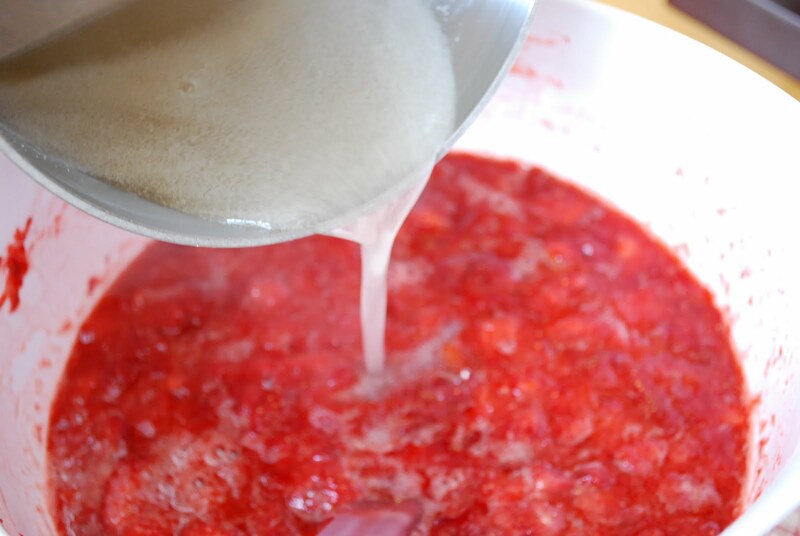 Stir boiling pectin into fruit and stir for exactly THREE minutes. A few sugar crystals will remain. Quickly pour into prepared jars, wiping clean the top edge. Fill to within 1/2 inch from the top. Cover at once with lids. Let stand at room temperature, untouched, for 24 hours. 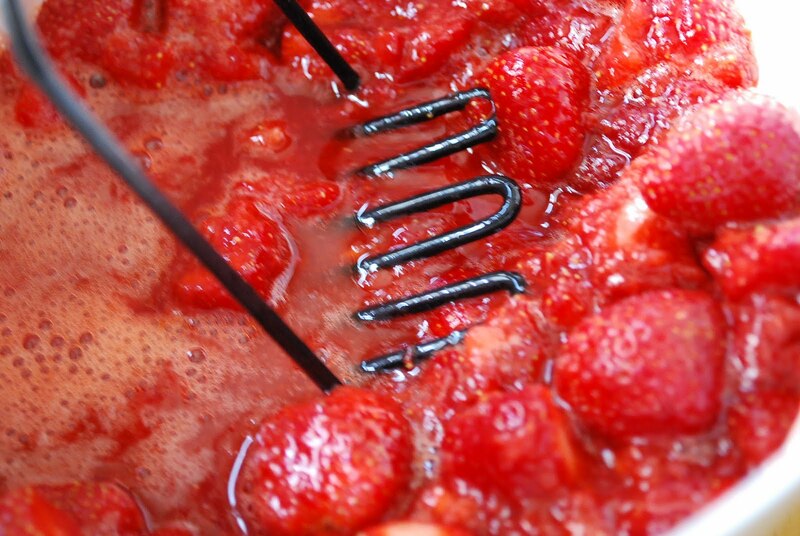 This step is very important to ensure that the jam sets properly. Store in the freezer and refrigerate after opening. As you can see, I doubled my recipe. Wash, scald and dry containers and lids. You can do this in your dishwasher or I put mine in a pot of boiling water for several minutes. Wash berries and remove stems. Place in a large bowl.Mash berries with a potato masher or pulse a few times in a food processor. I use the hand mash method because I like my jam to be a bit chunky. Pour mashed berries into a measuring cup and make sure that you have exactly two cups. Measure whey low or organic sugar accurately by scraping a knife across a full cup to level. Place into a separate bowl. 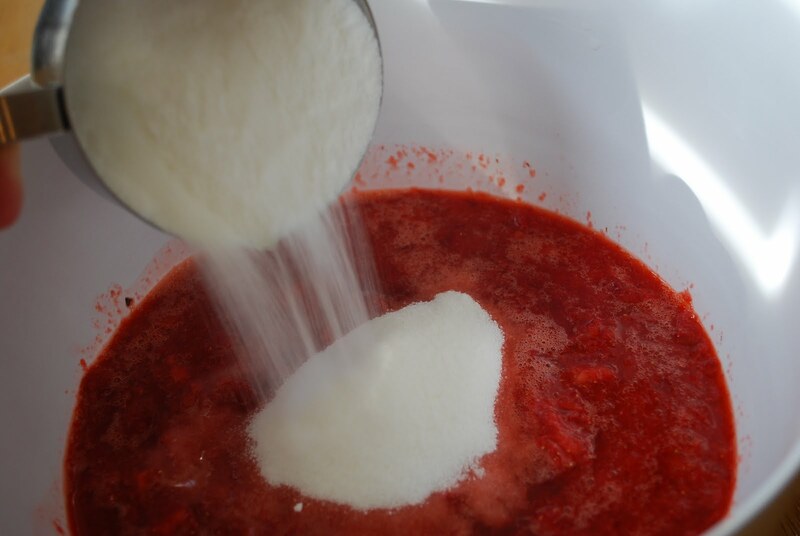 Combine sugar and berries in a large bowl and stir until thoroughly mixed. Let stand for 10 minutes (very important), stirring occasionally.Mix 3/4 cup water and one box Can-Jel into small saucepan. Over high heat, bring to a boil and boil for exactly one minute, stirring constantly.Stir boiling pectin into fruit and stir for exactly THREE minutes. A few sugar crystals will remain. Quickly pour into prepared jars, wiping clean the top edge. Fill to within 1/2 inch from the top. Cover at once with lids. Let stand at room temperature, untouched, for 24 hours. This step is very important to ensure that the jam sets properly. Store in the freezer and refrigerate after opening. oh my gosh…I can’t WAIT to try this! 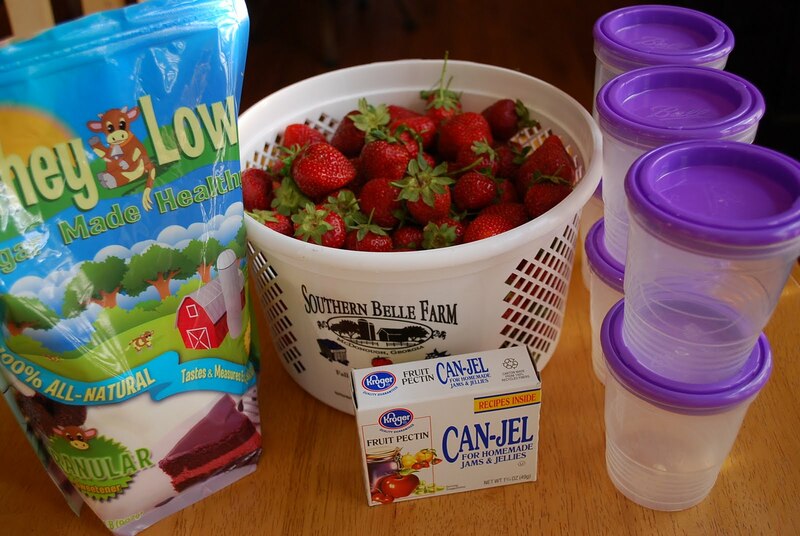 I adore strawberries this time of year and I know this jam would be outstanding! Thanks for sharing!! Amee I make strawberry freezer jam every year. My husband and kids eat it all year round and would freak if there wasn’t a jar in the fridge at all times. 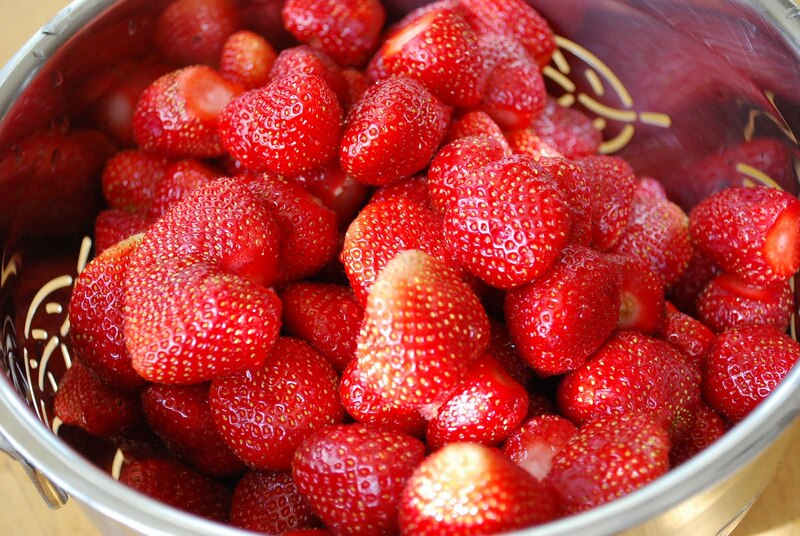 I love strawberry season! Liz, I know exactly what you mean! It doesn’t last long here, either. We love it!!!! Can you tell me how many tsps of pectin to use instead of ounces?